This blog is focussed on dyslexia and hyperlexia. I have both conditions. Some blogs will offer tools I have implemented to reduce the discomfort of being dyslexic and/or hyperlexic. I will also report on meetings I attend or other information that I feel might be useful for a dyslexic or hyperlexic. If you wish to comment on this blog, simply scroll down to the bottom of this blog and hit comment. Removing refined sugar from my diet with healthy sugar substitutes. I feel passionate about this step. It has made a big difference in my life. I will be honest. It was not easy to do. In fact, it took about six months. But, removing refined sugar was worth it. The uncomfortable feeling of an inner rushing which ran up my chest and into my head all but disappeared. I thought this inner rushing was naturally me. Not true! And, now, I stay focused longer on reading tasks. This list comes from my shopping at Rainbow Grocery, 1745 Folsom St. San Francisco, CA. www.rainbow.coop They offer a wide variety of healthy products. These products can be bought nationwide. Note: the abbreviation ECJ: refers to Evaporated Cane Juice as the sweetener. 1. Sugar substitutes for cooking and with tea or coffee etc. I make a wonderful pecan pie, using the Joy of Cooking recipe substituting sugar with Brown Rice Syrup or Agave syrup and substituting corn syrup with pure maple syrup. My friends say it’s better than the original recipe. These are some of my favorite cereals which come in bulk size. Hint: Some of these products can be bought in bulk through Amazon.com. I eat these chocolate chips as a snack. They are not too sweet and satisfy my sweet need. They are delicious in Chocolate Chip Cookies, etc. 4. Cookies: Here are just a few examples. Don’t forget fresh fruit. That is the best source of natural sugar. A future blog will discuss the symptoms I experienced while eliminating refined sugar and some of the steps I took to help myself through the detox period which lasted about six months. If you have topics that you would like me to address about my experience in overcoming dyslexia and hyperlexia send your comments through this blog. And, I am planning to continue evolving this site. I want to incorporate dyslexic and/or hyperlexic information that others have to share. Yes, I am looking for your ideas. Send them via the Comments. below. Information on this blog is intended to complement, not replace, the advice of your own physician or health care professional. Want to know what if feels like to be dyslexic? © 2010. 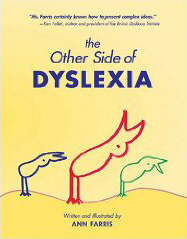 Dyslexia Discovery, Ann Farris. All rights reserved. The material contained within the website may not be reproduced or disseminated without prior consent from Ann Farris. This web site is not to be interpreted as an independent guide for self testing. The information provided is intended to complement, not replace, the advice of your own physician or health care professional.